In life we often put things off for a better day, sometimes pushing our hopes, our dreams and our goals aside because we think we have all the time in the world, and for most of us (the lucky ones) we do. Sometimes though, life can throw you a curveball and the unthinkable can happen; an accident, a diagnosis or an unfortunate act of nature can come crashing through your front door and take all that time you thought you had away. As cliché as the statement is, I am a firm believer of “you only live once” I base my life on this saying. Don’t get me wrong, I don’t mean quit your job, sell your house and travel the world. I work just as hard, if not harder than most. My world revolves around working 6 days a week, a minimum of 10 hours a day and if I’m lucky I have a month or so off at a time about once a year. Despite my wacky world of working in warehouse trailers all over Canada and the States, I make the absolute best of my time off and I refuse to waste a day off that could be spent outdoors. 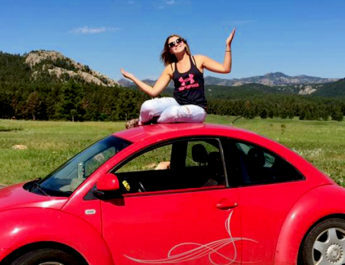 I have established an extensive bucket list over the years, but I’ve already managed to cross some things I’ve wanted to do and experience off this list; traveling with my best friend across state lines between North Dakota, South Dakota and Wyoming, reaching our desired destination, Yellowstone National Park. 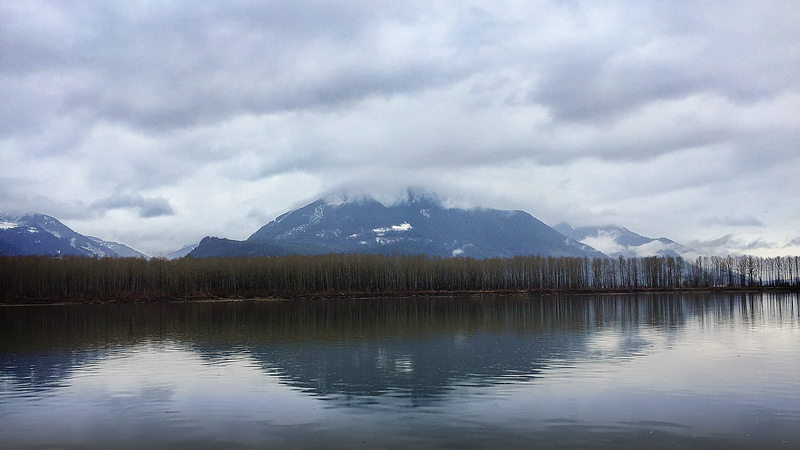 Snowmobiling through the mountains in Revelstoke, BC and most importantly catching as many new species of fish as I can. This past weekend I managed to cross a big one off my list! 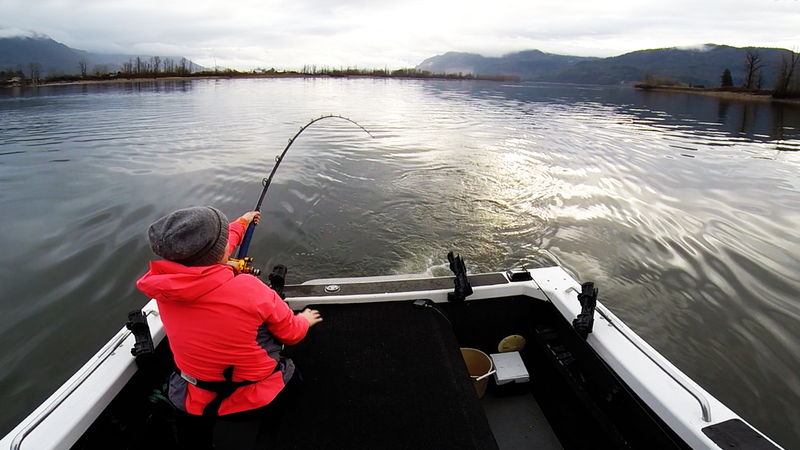 Fishing for monster sturgeon on the Fraser River in the Rocky Mountains of British Columbia. As I sat at work Saturday pondering about what I wanted to do with my day off, I realized that all my work friends had previously made plans. I thought to myself “oh no, maybe I’ll just sit back at home and watch movies all day. God knows I probably need a rest day” but am I ever glad I had a spontaneous idea. 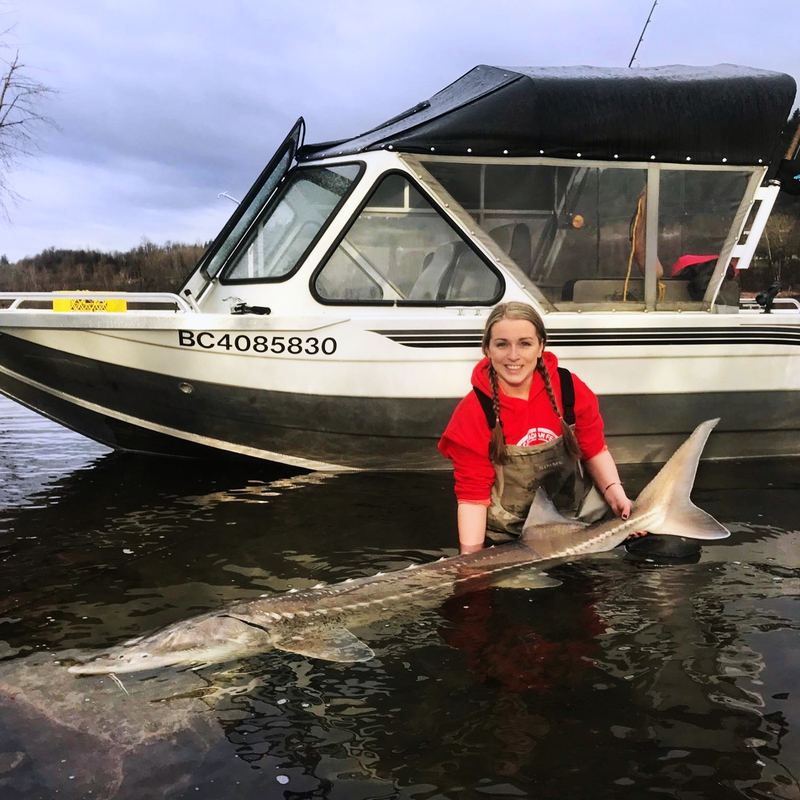 Everyone who knows me knows I love spending my time with everyone I can, so when the idea of getting a guide for fishing sturgeon popped into my head, I immediately got a little nervous. Was I actually going to do this alone? I remembered one of my good fishing buddies telling me about her trip to the Rockies and the guiding company that she went with, so I looked them up and dialed the number. It went through my head that this was crazy last minute and that they may not even have any availability for the next day, but they pulled some magic and got me confirmed. 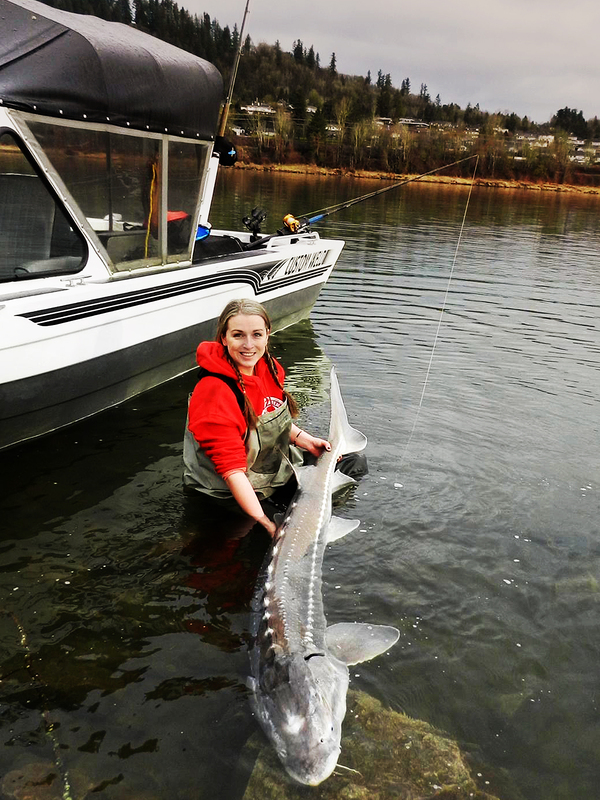 Monster sturgeon fishing with Great River Fishing Adventures on the beautiful Fraser River, just outside of Mission, BC was all set for Sunday morning. My arrival time was set for 8am, but since I am so used to getting up at 4:45am every morning for work, it was only natural that I arrived early, besides my level of excitement for this adventure prevented me from sticking around the house too long. My guide was Landon, he was super eager to meet with me and didn’t have a problem with me being early, leading to a few extra minutes of fishing time! We got off to a slow start, no bites not even a nibble for the first hour or so but great things come with time, right? Darn right they do. Then, a couple nibbles! I watched, waiting for it to take the bait. 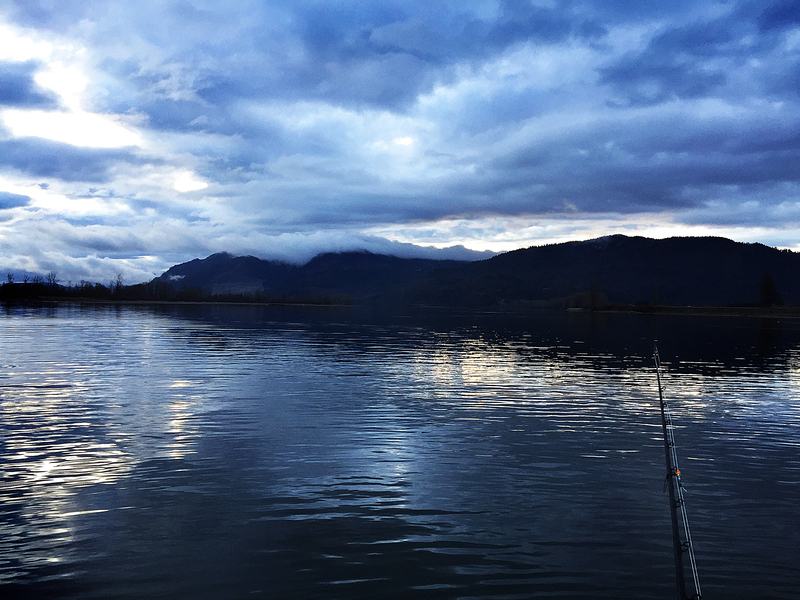 I grabbed the rod out of the holder and slowly reeled the tip to the water, once I felt that tug one more time I set that hook like it was nobody’s business. I guess I should have known better; those monsters that lurk below, pack a huge punch. The whole ordeal from setting the hook to reaching the shore was about 30-45 min long. My arms felt like Jello and not even the cute wiggly Jello, I’m talking about sat-out-in-the-sun-and-melted Jello. 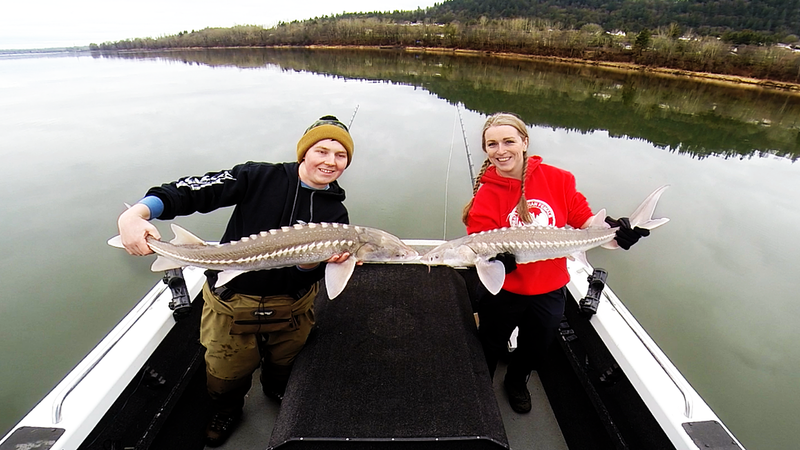 I struggled into my waders, got into the water and measured my first ever bucket list sturgeon at a whopping 6’7″. It was no record breaker but the smile on my face and the warmth I felt in my heart was worth more than anything else. I quickly took some pictures with this big beautiful dinosaur and got to watch it swim away back into the darkness of the river. 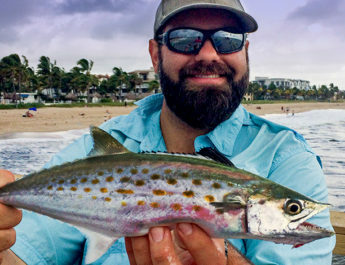 As the tail left my hands it was the most incredible fishing experience I have ever had and that was just the beginning of my day, I still had 4 ½ more hours to spend searching for these amazing creatures. The day continued to surprise me with many smaller healthy sturgeons which was great because it shows how well this fishery is doing. Then to top it off, Landon and I finished with a double header! All in less than a day I was able to cross one more thing off my bucket list, add one more memory to the bank, had one more story to tell and had a lot more pictures to add to my albums. I feel like I’ve been hit by a truck and have bruises I didn’t even know I had but every minute was worth it and I’d do it again in a heartbeat. I conquered a small personal hurdle of mine and realized that spending some time with myself doing something I love can make me stronger and allows me to meet new people and make new friends. Don’t let life slip by you, you never know how long you have to do what you love most. Why wait? You will never regret accomplishing your goals, achieving your dreams or seeing your hopes come true no matter what they are. 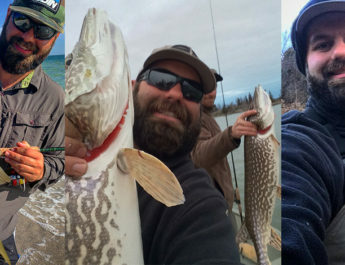 A good portion of mine are fishing related and if one of yours involves fishing for sturgeon and having a day full of smiles, laughs and good times, I highly suggest contacting Great River Fishing Adventures and setting up an adventure of your own!